- 3 tablespoons of onion powder. In a bowl combine the halibut, oregano, butter, scallion and cayenne pepper. Add the seasoning to your halibut and brush with olive oil. Grill the halibut for 4 minutes on each side and enjoy. Halibut is a tasty summer dish. Halibut also boasts many health benefits. Halibut is a great source of vitamins B12 and B6 and is rich in folic acid. These vitamins prevent damage to artery walls. Halibut can also lower blood pressure and help prevent arthritis. 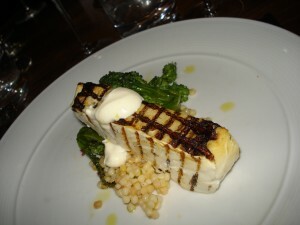 Many people wonder what types of food will go best with halibut. When choosing a wine, go with Pinot Gris. Pasta and vegetables are a great side dish to go along with halibut.